Within 250 miles of San Jose, CA. You can be a champion in the pool and in the classroom! At this unique Fitter and Faster swim clinic, Felicia Lee, a Stanford graduate with a degree in human biology and NCAA champion in the 100 fly, will teach participants skills to race faster AND tips to balance a challenging academic schedule with traininig at the highest level in swimming. The most missed opportunity to drop time is in the TURNS! Learn how to blast in and out of the wall faster than ever with National Champion Felicia Lee. She will be in the water teaching participants to be more efficient and explosive at every wall. FLIP TURN: Did you know that the faster you accelerate into the wall, the faster you will leave it? Learn to use your momentum in the most efficient way by tucking into a tight ball and landing in the perfect pushoff position. Felicia will teach participants drills and exercises to not only improve on this skill right away, but to be able to continue to practice and improve in the future. OPEN TURN: Most age group swimmers don't execute the open turn correctly. Think of it more as a backwards spin instead of turning around. Tuck in a ball, drive your knees into your chest, and keep your arms in close. By working on being small and quick with each movement, all participants will turn faster and drop time! FINISHES: Close races are won by having the proper finishing technqiue in every race. Learn from Felicia how to keep your head down, your body long, and get your hand on the wall faster! 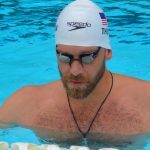 STREAMLINES: A great streamline is more than just putting your hands together over your head! Get tight, striahgt, and strong from fingertips to toe tips. Felicia will teach participants how to engage your core and maintain the proper spinal alignment for maximum efficiency in your streamline. STARTS: Get off the blocks faster and with more speed and power by learning the techniques of National Champion Felicia Lee! Your swimmer will learn to set up on the blocks in a position that will allow them to explode forward. Make sure to be fuly engaged in the air as you throw your hands forward into a tight streamline. 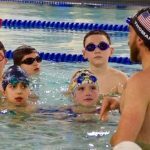 Your swimmer will learn drills and exercises that will help make them faster at this clinic! RELAY STARTS: Timing is everything! Learn from Felicia Lee how to time an arm swing and throw your body forward with efficiency, control, and SPEED for the fastest relay starts on your team! Swimmers and parents are invited to ask Felicia questions during a Q&A session. Gain insight into her training regimen, diet and nutrition, and recovery tactics. Observe Felicia swim at full speed and demonstrate a progression of perfectly executed drills to achieve powerful, efficient and fast swimming. Take a photo while wearing Felicia's medals, get autographs, and a gift from TYR Sport!